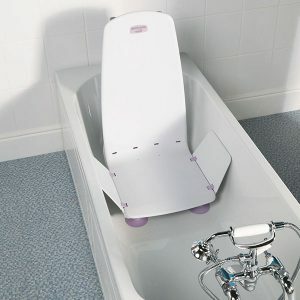 Bath Lifts have become increasingly popular since they were made to sit inside the bath itself and incorporate a fixed back rest for added support. These new modern Bath Lifts use low voltage handset controls which have rubber suckers on them so they can be attached to the wall tiles or bath sides for easy accessibility. They are completely waterproof and unharmed if submerged into water. The handset stores the batteries which operate the Bath Lifts and they are easily charged using a small convenient wall charger similar to that of a mobile phone.